Dundee facts about WW1 :: Great War Dundee - This is the story of the 30,490 men that left Dundee to fight in the First World War and of the people left at home. The outbreak of the First World War Great War created a national swelling of pride and many men and women committed to doing their “bit”. It is estimated that 63% of the eligible men in Dundee joined the fight, equating to around 30,500 men. Dundee had one of the highest contribution rates of any British city. Sadly more than 4,213 of those men never returned to Dundee. Joseph Lee, Dundee war poet and artist. Dundee had its own war poet and artist, Joseph Lee. Joseph Lee’s poetry was once ranked alongside those of famous World War One poets Wilfred Owen and Siegfried Sassoon but the Dundee writer and artist has fallen out of the public consciousness. Lee was almost 40 years old when war broke out and he enlisted in the 4th battalion of the Black Watch. Lee had previously worked as a journalist on the Dundee Advertiser and the People’s Journal as well as producing and illustrating his own newspapers and magazines. In October 1921, a lead casket contained within a beautifully-carved little cabinet was put on public display in Dundee. Attached to it was an engraved brass plaque with the words, ‘To be opened on the 4th August 2014, by the Postmaster in the presence of the then Lord Provost’. Despite many changes in the business and the removal of the casket to a storeroom in a sorting office in Dundee, the casket was opened and now reveals a fascinating insight into the war. You will be able to read more about the casket’s history and contents here. The 1st Battalion at Roisdorf on 23 November 1918. A number of soldiers in the first row appear to be young boys. The patriotic fervour that enveloped the country after the outbreak of war resulted in many young men enlisting. Although the rules for recruitment were simple, to enlist and fight abroad, you had to be nineteen or over (you could enlist at 18 but not serve abroad), many young men under the age of 18 were excited at the prospect of war and, with the perception that it would be over by Christmas 1914, found ways to enlist! Several Dundee men joined up and served before they turned 18. Hugh McKenzie’s Victoria Cross was one of 628 awarded during WW1 for valour in the face of the enemy. Hugh was born in Liverpool on 5th December 1885. He and his siblings lived with his widowed mother in Inverness before the family moved to Dundee when he was a child. McHugh McKenzie was awarded a V.C. for his valour during WW1. Like many, Hugh emigrated to Canada but he spent much of his youth in Dundee and returned there whilst on leave to visit his mother and family. He attended Rosebank Primary School as did his daughter, Elizabeth. A memorial plaque in his memory remains in Rosebank School. Hugh’s wife, Marjory McGuigan, was a Dundonian and his parents were married in Dundee in 1877. Picture credit: Joseph Lee... courtesy of University of Dundee Archive Services. 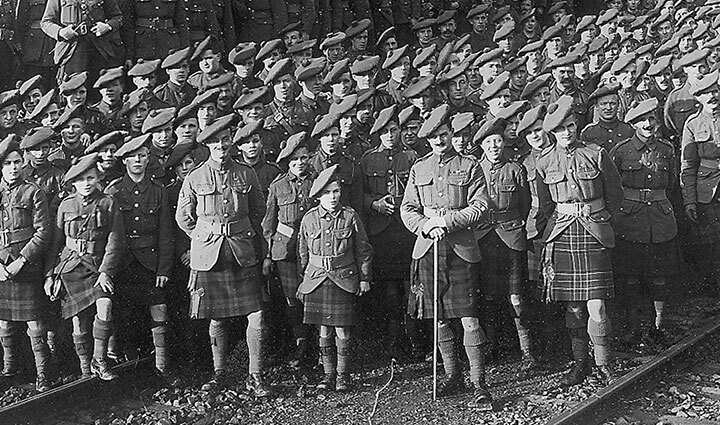 The 1st Battalion at Roisdorf... courtesy of The Black Watch Museum. Read about Joseph Lee - war poet on Wikipedia. Read about WW1 boy soldiers on Wikipedia. Age 14 - An Irish Boy Soldier, by Geert Spillebeen. Based on fact about a boy enlisted to fight.